El Almanza of Laguna Ocean Foundation, which won a grant to explore restoration of Aliso Creek’s estuary. Photo by Jody Tiongco. 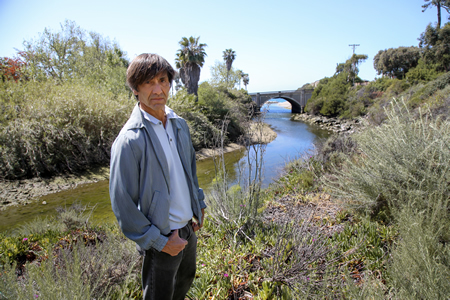 The city of Laguna Beach will host a free public lecture at 7 p.m. on Thursday, Aug. 30, to present proposals for an estuary restoration project at Aliso Creek and its implications for the future. The lecture will be held in the community room at the Laguna Beach Community Center at 380 Third Street. The proposed restoration project will be presented by Laguna Ocean Foundation Project lead coordinator Ed Almanza, who will be introduced by Laguna Beach Mayor Pro Tem Rob Zur Schmiede. The foundation received a grant from the California Coastal Conservancy to develop a conceptual restoration plan to return the Aliso Creek estuary to a healthy ecosystem. The presentation will include slides and videos to describe the local and regionally significant benefits of the restoration project. This lecture is the third of four in a series of educational events presented by the city’s Environmental Sustainability Committee. For more information, contact environmental specialist Mike Phillips at 949-497-0390. The city of Laguna Beach and the Laguna Beach Unified School District (LBUSD) renewed their Joint Use Agreement for use of shared sites and also entered into an agreement to establish a School Resource Officer Program in the district. The program will assign one Laguna Beach Police Department law enforcement officer to district facilities during the nine-month school year. The mission of the SRO program is to reduce school-related violence and crime committed by juveniles and young adults and foster a program that will build a positive relationship between law enforcement, youth, parents and school administrators. The district will make a formal decision on the program at its Aug. 21 meeting. At its Aug. 7 meeting, the Laguna Beach City Council approved a tree-replanting plan for 27 vacant tree sites located in downtown and along Coast Highway. Over the past few years, several trees located within the downtown area and along Coast Highway have been removed due to vehicle damage, disease, death, storms and Caltrans projects. Each site has been assessed for the replanting effort and a recommended replanting list has been created. The Council decided Tuesday that vacant tree wells in the downtown and along Coast Highway will be replanted in accordance with the Planning Commission’s recommended species.